The parody film is a tough genre to pull off. Since the invention of the form, arguably with the Zucker brothers Airplane (a take-off on 70s disaster movies), it has followed a fairly rote formula of exaggerating the target genres most egregious clichés and throwing in some pop culture references, sight gags and pratfalls. But where sublime comedy can be the result (Naked Gun 2 ½), the form is just a hairs breadth away from Scary Movie 4 land, territory that makes Hot Shots Part Deux seem intelligent and well plotted. Into this minefield strides current comedy MVP Judd Apatow, who, along with director Jake Kasdan, co-writes Walk Hard: The Dewey Cox Story, a spin on the new vogue of self-serious musician bio-pics. Apatow and Kasdan face an even greater challenge though - theyre putting their comedy eggs not in the genres basket but in that of (for the most part) one film: the Johnny Cash romance Walk the Line. Fortunately, with underrated actor/comedian John C. Reilly in the lead, Walk Hard manages to be hilariously self-serious, authentically musical and reach beyond the restrictive confines of the one-note music joke. 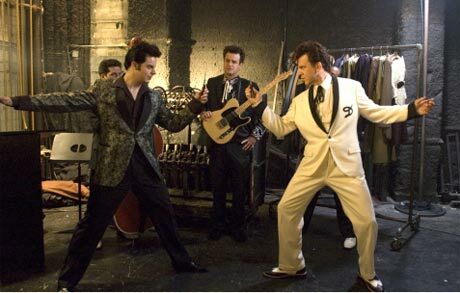 Though it very closely resembles Walk the Line (especially with disgruntled Pa Cox turning "the wrong son died into a running gag), Walk Hard spins in a number of different directions by the end, taking on the Beatles (Jack Black, Paul Rudd, Jason Schwartzman and Justin Long), Buddy Holly and Elvis Presley (Frankie Muniz and Jack White, respectively) and putting Dewey Cox through a crazed orchestral Brian Wilson period. However, Walk Hard shows appropriate respect and understanding of musical genius before it splatters it with comic absurdity.